Do you feel like your mom style is non-existent? Are you stuck in a rut with outfit ideas? Being a mum and always having a wardrobe full of clothes for every occasion can be quite daunting and bordering on impossible. If you are sick of your mom wardrobe and feel like you have a closet full of clothes that you never wear, read on! In this post, we will talk you through each simple step to create a comfortable, stylish and practical, stay at home mom capsule wardrobe, to see you through any occasion, without having to buy any new pieces! Whether you need a work from home capsule wardrobe or a stay at home mum wardrobe , we will show you how to make a capsule wardrobe to suit your life! A stay at home moms capsule wardrobe needs to be comfortable, practical and stylish , and it sometimes feels like an overwhelming task to create a classic capsule wardrobe and build wardrobe essential which can survive the hours of a stay at home mom. Being able to get dressed quickly. Being able to create and plan stylish outfits without even thinking about it. Everything you own, you love and will wear. You spend less money on clothes. You have more space in your stay at home mom capsule wardrobe! Why you need a stay at home mom capsule wardrobe. Clothes which you bought in the sales and you thought were a bargain. Clothes other people have given you. The short mini skirt which would be better suited to a 20-year-old. Long flared jeans you never bothered to take up. How many are hanging in your wardrobe right now? Have you ever asked yourself why they are still there? Do the following excuses pop up every time you try to have a clear out? It cost me a fortune! My sister gave me this! I’m waiting for the right occasion to wear it! I’ve got nothing to match it. I’ve had it since I was a teenager! 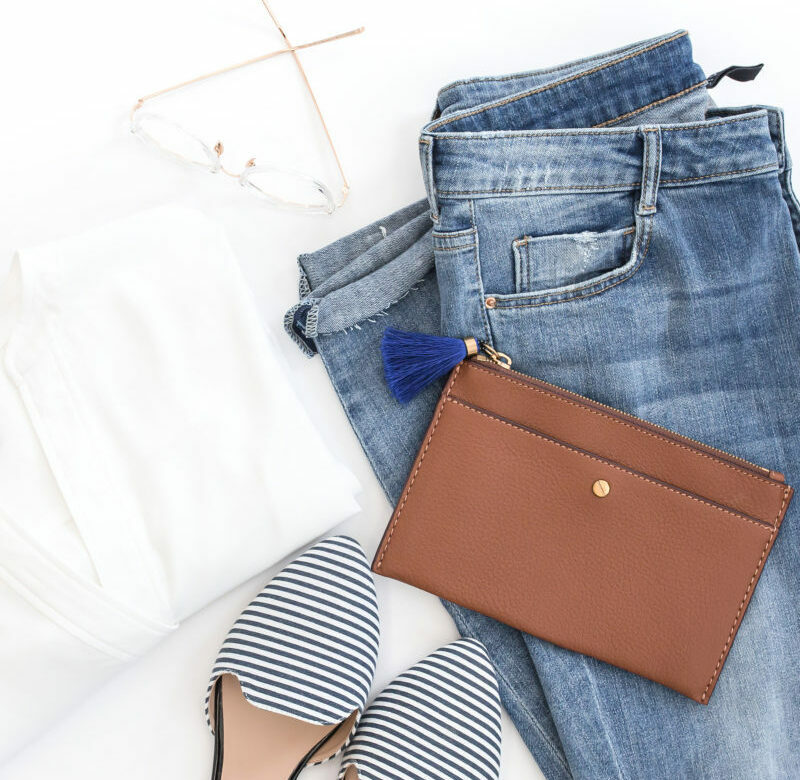 If any of these excuses sound familiar to you, they could be stopping you from having the mom capsule wardrobe you’ve always dreamed about. Every time you open your wardrobe door these items silently make you feel guilty. Let me present an answer to those silent excuses you use for clinging on to stuff you never wear. It did cost you nearly a months wages, and yes that makes you feel seriously guilty, but you have spent the money, and the garment is making you feel crappy and guilty every time you notice it. Just because you paid a fortune for it doesn’t mean that it’s of value to you, forget the designer label, if it had only cost £10 would still keep it? It’s great to hear that you’re going to lose weight, but let me tell you when you get down to your ideal weight the first thing you’ll probably do is treat yourself to some gorgeous new outfits! Your sister/mum/daughter gave it to you? Guess what; they didn’t wear it either! If you are waiting for the right occasion, the chances are you’ll buy a more fashionable outfit to wear than the one you wore to your sister’s wedding in 1992! If you loved it, you’d have found something to wear with it by now! You won’t wear it again! I’m not saying you should get rid of stuff you love, but just the things that make you feel bad, the stuff you make excuses for! How to create a stay at home mom capsule wardrobe. We are not going to go on a massive shopping spree to create your stay at home mom capsule wardrobe. We are going to try to use as many of the items in your closet as possible; you’ve probably already got a few items of clothing in your closet that you wear all the time, that you are comfortable in and which make you feel good. We are aiming to get your wardrobe streamlined with clothes that make you feel good all the time! Try on every single item of clothing you own. Put on every garment without looking in the mirror. See how each garment feels. Is it comfortable, does it feel nice against your skin, can you move freely? If you can’t answer yes to all of those questions, then put the item of clothing in the donation pile! If the garment feels fantastic, it is time to see how it looks! Do you like the colour, the length, the style? If it meets all those criteria, then keep it, if not put it in the donation pile. With the remaining garments, put them into piles of tops and bottoms, shoes, coats and accessories. Choose three colours for your stay at home mom capsule wardrobe essentials. Choose a splash of colour. Donate all clothes which do not fit within your four colour rule. Donate any clothes that do not fit in with your four chosen colours. The reason for getting rid of mismatched clothes is so that eventually you will be left with a stay at home mom capsule wardrobe where every item can match with any other garment in your closet. Having stray mismatched garments indicates you’ll be tempted to buy other unsuitable items to go with them and your wardrobe will not be sleek and streamlined. Assess your stay at home mom capsule wardrobe needs. Write a list of jobs you do each day, be honest and don’t miss anything out! For instance, if you visit a soft play area with your toddler every week, you need to make sure you’ve got clothes that are comfortable enough to crawl and climb around in! Think about what you require from your stay at home mom clothes. Write down all the things you require from your clothes, eg, comfort, loose, fitted, long, short etc. if any of the remaining garments you have selected do not fit these criteria put them in the donation pile. You should now be left with a selection of well-fitting clothes that are comfortable and all go well with each other. You now need to start to create a practical wardrobe that meets all your daily needs from the clothes you already have. Make sure all your underwear is comfortable and fits well, it should be so well fitting that you can’t feel that you have any on! Next choose your essential items. Next, choose base layers such as t-shirts or vests in your base colours. These are the items closest to your skin, so make sure you have one for every day. I have four black, two grey and one white vest. They are all the same brand as I know they are the correct length for me. Next choose which pants you’re going to keep. Next, choose some pants, there is no rule here except that they should be within your four chosen colours and be comfortable enough to move freely. Trousers jeans and leggings get very dirty when you are running around after small children, so my advice is to make sure you have a clean pair for each day of the week. I find that jeans, dungarees, shorts, playsuits, and leggings are much more practical than skirts or dresses if you have small toddlers. Decide which tops to keep. Tops, the rule here is to keep within your chosen colours and consider exactly what was on your list of clothing requirements. If you like to cover your bottom there is no point buying a pretty short top as you will never wear it, look for a long tunic or shirt instead. You can choose a pattern as long as it has only your chosen colours in it. Choose simple tops that will be just as pretty to go out for a coffee with friends as they would at the soft play with your toddler. If you wear plain tops, you can get away with wearing the same top more often. Therefore you need fewer items in your closet. However, if you prefer to wear patterns, it’s not as easy to get away with the same outfit more than once in a week, so this is something to bear in mind when out shopping for essentials. I like to buy a plain top with a hint of my accent colour somewhere on the garment. Jumpers and cardigans should be practical, within your chosen colours and fit in with your list of needs. I find having a cardigan in each of my four chosen colours ties all my outfits together. Splash out with colours here, bags belts, shoes and scarves can all be a stylish, practical addition to your stay at home mom capsule wardrobe. Create a capsule wardrobe checklist. Create a checklist of all the items you are missing in your stay at home mom capsule wardrobe. Take it with you when you go clothes shopping so you don’t end up buying stuff you don’t need! Shopping for clothes when building a capsule wardrobe. The decluttering guru Marie Kondo, has a theory that when purchasing an item, we get the thrill of the purchase, which dissolves almost immediately when we walk out of the shop. She believes that the item you have purchased has done its job, it made you feel great at the time; therefore it has served its purpose and it’s time to let it go. I found this advice invaluable when permitting myself to let go of those items and get them out of the house without feeling guilty, especially all those designer items with the price tag still attached! It’s amazing how differently I shop now too. I’m a lot more mindful of how much I’ve discarded; I now see each purchase as a future charity shop donation, so it makes me so much more mindful of what I am buying. I steer clear of bargains and cheaper brands as I quickly released that these made up about 95% of the clothes that ended up in the donation pile unworn. I never go shopping without my minimalist wardrobe checklist so I know exactly what I need to buy! Have you noticed that men never have a problem with having unsuitable and unworn garments? They are always able to open their wardrobe and grab whatever is on the top of the pile and be out the of the door within seconds. The reason men can get dressed in a hurry every single time without a second thought is that they only have a few plain colours to choose from and virtually no over complicated patterns. They always dress for comfort and simplicity. You can do this too if you are skilful with your colour palette. Once you find your signature colour, shopping for clothes becomes amazingly simple and a lot cheaper, as every item you buy will go with every other piece you already own, to create a plethora of new outfits. Here is an example of how a few, well-chosen pieces can work well together, to create lots of fabulous outfit opportunities. I’ve chosen Navy, Grey and Black as my base colours, and Yellow as my accent colour. I’ve picked comfortable, stylish clothes with a slightly edgy twist, some of these items would transition into casual evening outfits too. Once you have created your basic stay at home mom capsule wardrobe you will be able to see the essential garments that are missing and you can pick them up when clothes shopping instead of wasting your cash on something you will never wear! Have you ever tried to streamline your closet into a capsule wardrobe? Did you succeed or go back to your old habits? Let us know in the comments! For advice on how to start a minimalist summer wardrobe which easily transitions into a fall capsule wardrobe for autumn, read this post! To learn how to build a kid’s free mini capsule wardrobe and stop the clothes clutter read this guide. What should I be wearing as a stay at home mom? Whatever you find most comfortable! There is no hard and fast rules to a stay at home mom capsule wardrobe , don’t worry what anyone else is wearing, find your own style and embrace it! Can I just have 7 black t-shirts and 7 pair of jeans in my stay at home mom wardrobe? Yes, you can! When people dress like this it’s called a “personal uniform” and many minimalists choose to dress this way as it saves time choosing an outfit each day. This is one of the easiest stay at home mom outfits to put together each morning and can be spruced up with some accent accessories. Stay at home mom capsule wardrobe. I do hold on to some stuff for too long for all of the reasons you mentioned. I feel better about the areas in my house where I’ve done some purging!